Michael Franti is best known for being a musician, but lately he's been adding some other titles to his list of credits - like filmmaker, activist and peace advocate. That's because the frontman for eclectic rock band Spearhead recently premiered his first documentary, "I Know I'm Not Alone," and it's been making waves in both film and music circles ever since. "I Know I'm Not Alone" chronicles Franti's musical journey through war zones in Iraq, Israel and Palestine. Franti will be in Aspen this Saturday, March 25, for a screening of the film followed by a 30-minute Q&A and a solo acoustic concert. It was three years ago that the idea of creating his film first started to take shape. Franti was in a yoga class in his hometown of San Francisco the night before America invaded Iraq, when he was suddenly overcome with emotion. "I was trying to imagine what it would be like if some foreign air force was coming to bomb San Francisco the next morning," says Franti. "I wondered what I would tell my kids before I put them to sleep." In the months that followed, Franti was bothered by the news reports out of Iraq and other areas of conflict. They seemed void of emotion, he says, and neglected to show the true human cost of war. So Franti decided to find out that cost for himself. Armed with a guitar and a video camera, Franti made several trips to Iraq, Israel and Palestine over the course of two years. He spoke to ordinary people - American soldiers, cab drivers, restaurant owners and children who had lost limbs in the bombings. In Iraq, he heard first-hand accounts from the locals on what life had been like under Saddam Hussein and how it had changed since the war began. Franti says that many Iraqis resent the United States for what they consider to be an occupation - not a liberation. "I basically just walked around in the streets playing music for people," explains Franti. "A crowd would form and eventually the stories would be told." 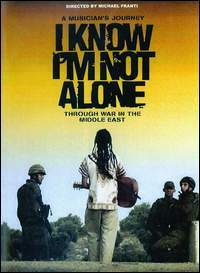 Currently, "I Know I'm Not Alone" can only be viewed at select screenings across the country, although the DVD version will come out this June. Franti is also writing a book about his experiences in the Middle East. "This film is not one that you can sit there and watch and say, 'Oh well,'" says Franti. "It's something that makes people feel inspired to work for peace. I hope my music can do the same thing." "I Know I'm Not Alone" isn't Franti's first project promoting social awareness. He's been advocating similar causes through his music since he first found his passion for songwriting while attending college at the University of San Francisco more than 20 years ago. Born in Oakland, Calif., to a single mother, Franti was later given up for adoption to a university professor and a school teacher. He was raised in Davis, Calif., where he often felt like an outsider in the community. He found solace with an assorted group of misfits - artists, musicians, teachers and basketball junkies. He went to the University of San Francisco with the intention of playing basketball, but he soon developed a passion for poetry. He later began setting his poetry to hip-hop, punk and reggae music. It wasn't long before he was playing on the campus radio station and forming his own band, a punk rock-reggae hybrid group called the Beatnigs. But time has tempered Franti's musical stylings, and his songs have lost the youthful rage of his early years. Today, along with his current band, Spearhead, Franti sings about peace and justice with a rocking worldly groove that's influenced by everything from reggae and funk to African and '80s rock. He laughs when asked if he considers himself to be a "protest music icon," a term that's often been applied to Franti. "That sounds like a category from 'American Idol,'" says Franti. "My songs are, at times, songs of resistance, but I also try to write about the full rainbow of human emotion: sadness, laughter, sexuality, partying - and also the political side of things." Franti's next album, set to be released in June, shares the same title as his documentary, which is fitting since many of his songs were inspired by his travels for the film. Franti says the album has far more guitar-centric tracks than previous CDs, although he also collaborated with multiple reggae artists for several of the songs on "I'm Know I'm Not Alone." For Franti, the transition from musician to filmmaker was an easy one. After all, says Franti, it's all about knowing how to tell a story. "As a songwriter, I'm also a storyteller, so I know how to tell a story," he says. "But I didn't know how to shoot film, so I surrounded myself with people who do." Franti's lack of cinematography experience seems to bring an endearing quality to the film. The documentary is shot and edited with a raw technique that makes the people seem all the more honest and real - which is exactly what Franti hoped to do. "I tried to let the voices of the people I filmed tell the story," says Franti. Franti's not sure if his music - or his film - will change the world. He just hopes that his songs will inspire ordinary people to do "the simple tasks that are the most difficult." "I don't know if music will change the world overnight," says Franti. "But I know music can help us make it through a difficult time, and that's how the world changes. It changes in the same way that a river carves a canyon."